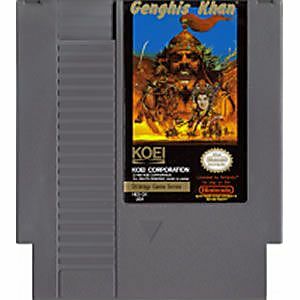 Genghis Khan original NES Nintendo Game cartridge only - Cleaned Tested and Guaranteed to Work! I love a strategy game that combines different civilizations on the same map for my warring pleasure. Genghis Khan is a great game with classic strategy written all over it. The musical score fits it pretty well too. I loved this game. 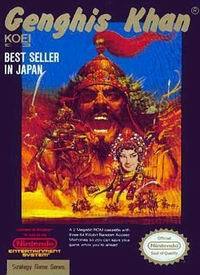 Many KOEI games are very fun and strategy oriented. You can play any leader in the world of Genghis Khan (1206AD). 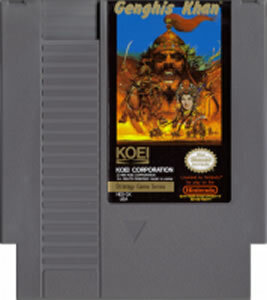 Build your army, conquer, the combat is very similar style(turn based) to "Romance of the Three Kingdoms" also made by KOEI. Make your main resource (silk, textiles and more), trade(buy & sell food and resources), govern, form alliances and you can have generals govern your territories for you if you want, but they can betray you and join another nation or make their own nation. Marry your daughter to that enemy that you wish not attack you. SOOO MANY MORE THINGS I'VE FORGOTTEN! VERY FUN GAME! This is a very in depth game of watching trade prices to make money, Train your troops as well as your leader, build armys and ultimately conquer a portion of the world. It was a favorite of mine when I was young and at 31 now I still love it! The music can get a bit annoying but great game!